Few things evolve more quickly than the desktop PC, but there is one constant: the process of getting smaller. The first computers took up entire rooms (and required a college degree to operate). But these days, you can get a gaming PC the size of briefcase delivered to your front door. But if you prefer to build something small, should you go with a microATX system, or is it time to go even smaller with mini-ITX? Since you’re reading Maximum PC, you probably already know that it’s blistering benchmarks that get our motor running. In fact, sometimes a new rig is more fun to tweak and test than it is to use for “normal” activities. You can actually get some premium mini-ITX motherboards these days that can overclock as well as a full-sized ATX motherboard. They do it by putting extra voltage-regulation modules on a riser card, since the form factor doesn’t otherwise leave a lot of room for bonus power phases. But if you want to run more than one video card at the same time, only microATX is big enough to give you that option. It also means a larger case; we’ve fit a 280mm radiator in the Corsair 350D, for example, with enough room left over for a 120mm radiator elsewhere. That means it’s much easier to liquid-cool a whole system for high overclocks. MicroATX has been around a lot longer than its junior-sized competitor, so the technology is more mature, and there’s a wider range of boards. It’s the de facto ruler of the modern cubicle farm. As a result, you can fine-tune your budget down to the last dollar and individual spec, whereas mini-ITX has more frequent gaps. However, there isn’t much variety in microATX cases. Most are designed for a full-ATX motherboard, which happens to take microATX boards as a side effect. If you’re looking for something particularly compact, mini-ITX has been getting a lot more love from case manufacturers and enterprising modders. The approaching extinction of the optical drive, coupled with the compactness of SSDs, allows more exotic dimensions and looks. But if you just want a basic tower that’s fairly easy to fiddle with, micro-ATX is the way to go. Thus, the winner in this category depends on your needs. If logic ruled the world, a mini-ITX system would cost less because the motherboards and cases are smaller. That means less raw materials. They’re not particularly difficult to manufacture, and they don’t use exotic ingredients. The problem is in the other typical parts, like the power supply. Mini-ITX systems frequently use a PSU form factor called SFX. These aren’t nearly as common as regular ATX units. So, by the laws of supply and demand, SFX units tend to be more expensive for comparable output and build quality. Especially if you want to get fancy with things like modular cables or “gold” ratings. It’s also hard to find a mini-ITX case for less than $50, which matters if your budget is tight. In fact, a good one usually hovers around the $100 mark, while you can get a decent ATX micro-tower or mid-tower for half that. Even when a mini-ITX system can fit a regular power supply, it usually has to be a small one without modular cabling, because there’s less clearance in these smaller boxes. Mini-ITX cases like the Cooler Master 130 Elite take a regular-sized PSU, but the unit sticks out the back by an inch or two. Meanwhile, a microATX tower like the Corsair 350D can take pretty much anything. Also consider the accessibility of a tower’s drive cages, fan mounts, and motherboard connectors. A “shoebox” ITX case has to have some of its guts removed every time you want to fiddle with a major component. That said, mini-ITX systems are lighter, easier to carry, take up less desk space, and can blend in better with home theater components. It’s the ideal LAN party form factor, something you can carry with you on public transit if need be, and even a conversation starter. Builders like us also like expandability. But as a rule, mini-ITX boards have just two RAM slots. With the four slots common to microATX, you have more options for the future. Two slots compel you to max out your capacity, which means spending around $150 for 16GB, instead of $60-$70 for two 4GB sticks. Mini-ITX also typically has only one card slot, for the GPU. If you want to add more USB 3.0 ports, sound card (they still have their uses! ), wireless adapter, or SATA Express coming later this year, then microATX gives you those options, and future options that we’re not aware of yet. You’re not stuck with the level of technology that’s built into the board. The “shoebox” shape is popular with mini-ITX systems because it can fit a full-length video card. If you’re a performance enthusiast, it’s hard to argue for the limited physical space of a mini-ITX system. If you need an HTPC, though, a little mini-ITX box seems like a no-brainer. 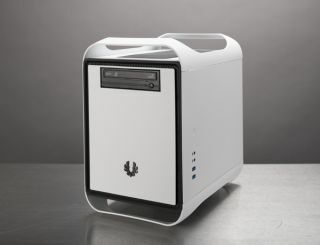 There are mini-ITX cases large enough to blur the lines, like the Corsair 250D. But they’re both constrained by the motherboard itself, which can’t do SLI or accommodate extra cards. So, we have to give the edge to microATX . This article was taken from the June 2014 issue of the magazine.